admin | "The Voice of the European Services Sectors in International Trade"
on SERVICES IN AN EVOLVING GLOBAL ECONOMY: Creating Sustainable Growth by Integrating Agro and Manufacturing that took place on March 6-8, 2019 in Mumbai, India. The summit gathered more than 300 participants from 30 countries. You can find more information on the dedicated website. In addition to the inaugural session, he contributed to the Panel Discussion on Importance of Services in Supporting Agriculture and Manufacturing Sectors on 7th March 2019. You can find his presentation here. 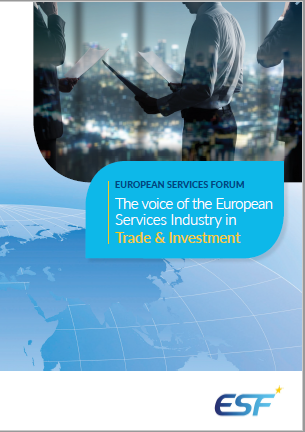 The European Services Forum (ESF) represents the interests of European services sectors that are, in a way or another, subject to specific regulation adopted by domestic regulatory authorities. The European Services Forum welcomed the Joint Ministerial Statement on Services Domestic Regulation, adopted by trade Ministers from 60 countries at the WTO Ministerial Conference in December 2017 in Buenos Aires. As the proponents of that initiative who acknowledge the good progress made in reviving the negotiations in the WTO Working Party on Domestic Regulation (WPDR) in Geneva, ESF could only regret that it failed to deliver concrete results in Buenos Aires. ESF, therefore, calls for the continuation at steady speed of the on-going negotiations that were mandated by Article VI.4 of the General Agreement on Trade in Services aiming at setting up disciplines in the countries’ domestic regulation on the various services sectors. ESF urges the negotiators to carry on the smooth atmosphere that prevailed in Geneva in this year 2018 so as to reach an agreement by the Twelve WTO Ministerial in June 2020 in Astana (Kazakhstan). See Position Paper here. ESF calls upon all WTO countries’ Trade Ministers for the adoption of a negotiating mandate in early 2019 to launch plurilateral negotiations – under the auspices of the WTO that would be accessible for all WTO members – that would look at setting up disciplines in various related aspects to international e-commerce. ESF calls for the discussions to move smoothly and rapidly with an intention to reaching a high standard agreement if possible by the Twelve WTO Ministerial in June 2020 in Astana (Kazakhstan). ESF particularly urges Trade Ministers gathering in Davos, in the traditional ministerial meeting taking place in the fringe of the World Economic Forum, to take a clear stance on this issue. See Position Paper here. The European Services Forum called all Members of the European Parliament to take their responsibility and ratify the EU-Japan Economic Partnership Agreement (EPA) when the vote will take place tomorrow 12 December 2018 at the plenary in Strasbourg. See Statement here. Trade in services between Japan and the European Union (EU) amounts to € 50 billion per year, with an increase of 160% since 2010 for the EU exports and € 13 billion surplus for the EU in 2016. Exports between our two regions are projected to increase by nearly a third in both parties. Trade and investment in services, although often not clearly grasped by the members of the European Parliament, create a significant amount of jobs and growth in the EU. Trade in services represents 24.4% of the EU GDP, and supports more than 20 million jobs in the EU. The EU-Japan EPA will contribute to improve this situation, Japan being the fourth largest trading partner of the EU in services. Mr Pascal Kerneis, Managing Director, European Services Forum expressed his view about Fintech in the landlocked world by mentioning the need for investment in telecommunications and IT infrastructure; the need for strong regulation to manage financial risks. He invited the 32 existing Land locked countries to adopt investment attractive legislation for investors and provide positive signals by joining WTO initiatives on E-commerce and services domestic regulation. The Global Services Coalition (GSC) sent a letter to Indian highest authorities to express serious concerns in relation to the Indian Government’s apparent increasing use of mandatory data localization requirements, including the Reserve Bank of India’s April 6, 2018 Directive requiring that all data relating to electronic payment systems be stored locally in India, as well as the data localisation requirements contained in the 2018 Personal Data Protection Bill (PDPB). See letter here. GSC argued that data localisation requirements and other policies that restrict data flows are likely to constrain growth and innovation, and reduce the scope for leading Indian IT firms and their foreign businesses’ counterparts to engage in business and investment contributing to promoting India’s competitiveness and growth. GSC also mentioned that data localisation requirements can weaken rather improve data security. The Global Services Coalition released its Annual Statement in Washington on 17 October 2018 at the occasion of the CSI Global Services Summit. “The GSC expresses its strong support for the WTO and the multilateral rules-based trading system, which needs to evolve to update the rules of world trade from yesterday to a rulebook for the 21st century. Businesses, local and foreign, in all sectors need to be able to compete in a non-discriminatory global environment. The WTO is critical to achieving this objective”. See here. Today, 12th October 2018, ESF joined a large group of Business trade associations to reiterate their strong support for the EU-Japan Economic Partnership Agreement (EPA), and call on the European Parliament to proceed with a swift ratification process, following the signature of the Agreement on 17 July 2018. This will allow both businesses and consumers as a whole to reap the benefits of this modern, comprehensive and balanced Agreement. “Japan and the EU are two like-minded and highly developed economies with a similar approach to today’s challenges and long-standing trade and investment links. Trade in goods and services between Japan and the EU exceeds 160 billion euro per year, and bilateral exports are estimated to increase by 29% for Japan and 34% for the EU.” Says the statement (here). This statement comes at a time where INTA committee of the European Parliament is examining the EPA, and where many MEPs have tabled a worrying large number of amendments, contesting the possible consent to the EPA. In the fringe of the WTO Public Forum 2018 that took place on 2-4 October in Geneva, Mr. Noel Clehane, ESF Chairman and Ms. Shobana Kamineni, Chairperson of the National Committee on Services of the Confederation of Indian Industries signed a Memorandum of Understanding (MOU), inpresence of H.E. J.S. Deepak, Ambassador of India to the WTO, where both parties agree to promote the development bilateral economic relations by providing a platform for businessmen to meet, discuss and explore business opportunities in trade, – investments, in the Services sector. You can find copy of the MOU here. On 2nd October 2018, the European Services Forum organised a Working Session at the WTO Public Forum 2018 that took place in Geneva. The title of session 23 – Room D – was “How can WTO contribute to ensure that technology enables trade in goods and services in 2030 and beyond? Is the E-Commerce Multilateral Initiative the right solution?”. The panel featured prominent experts like Mr. Hosuk Lee-Makiyama – Director – ECIPE (The European Centre for International Political Economy) ; H.E. Álvaro Cedeño Molinari, Permanent Representative of Costa Rica to the WTO; Mr. Adriaan Scheiris, EU Public Affairs Manager, UPS (business community); and Ms. Lee Tuthill – Trade in Services Division – WTO. The session gathered a full room of more than 120 participants.You can listen to the audio by following link on Session 23. Ahead of the WTO Public Forum that will take place this week (2-4 October 2018) in Geneva, the the European Services Forum finalised its Position on the WTO Reform. In times where international trade rules are challenged, the European services industries stand for praising the role of the World Trade Organisation (WTO). The setting up of the multilateral system has been the cornerstone of the development of the world economy since the second world war. The establishment of international rule of law, with countries taking commitments to respect their trading partners in exchange of mutually agreed access to each other markets, is the simple basis of today’s international trading system. It has allowed the prevention of major trade conflicts between nations and allowed the economies to strive, alleviating millions out of poverty, creating millions of jobs, fostering innovation and growth. This must be preserved. See full text of the Position here. ESF issued a press statement today, 17 July 2018, welcoming the signature of the EU-Japan Economic Partnership Agreement in Tokyo. See Press-Release here. On Friday 13 July 2018, on behalf of the Government of Japan, the EU-Japan Centre organised an event entitled: “The Japan-EU EPA: Expanding our Rules-Based, Free Trading Sphere to Create Economic Opportunities for Businesses”. H.E. Ambassador Kazuo Kodama delivered a key note address highlighting the important economic opportunities the EPA brings to business in Japan, the EU and the broader global economy. Hosuk Lee-Makiyama, senior fellow in the Department of International Relations at the London School of Economy (LSE) and lead author of the European Commission’s impact assessment study of the EU-Japan Economic Partnership Agreement, shared his analysis on the implication of the EPA on the trade and investment environment as well as highlight key findings from his new LSE Research Paper, published on 16 July 2018. ESF Director also contributed to a panel of that event. Today, 3rd July 2018, ESF sent its Position Paper on the European Commission’s proposal for a regulation of the European Parliament and of the Council “establishing a framework for screening of foreign direct investments into the European Union” to the three European institutions, ahead of the trilogue on that proposal. See Position here. As a question of principle, the European services industries strongly support the openness of the EU market to foreign direct investments. ESF advocates for a narrow and further clarified definition of security and public order to avoid different interpretations between different Member States. ESF supports the fact that the ultimate decision to allow, condition or block FDI lies with the Member State where the investment project is planned/completed. ESF takes note that services sectors are listed as “projects or programmes of Union interest” and calls for clearer definition of the notion of “critical infrastructures” as interpreted by the European Court of Justice. As for the sectors that should be screened, ESF believes that an overly detailed list might have a deterrent effect on Foreign investors who might hesitate to invest and innovate in the EU. We hence do not support the Parliament’s amendments for a long and detailed list of sectors. The European service industries called on the Brexit negotiators to recognize the critical importance of trade in services in the EU-UK future relationship. The United Kingdom’s exit from the European Union risks creating major disruption for services industries, with the danger of adverse consequences in terms of employment and wealth-creation across the EU and the UK. “The business community requires legal certainty as early as possible. We therefore call on the negotiators to take all necessary steps to minimise business disruption, to provide clarity as soon as possible on the Withdrawal Agreement, and to allow some flexibility in the management and duration of the transition period” said Noel Clehane, Chairman of the European Services Forum (ESF) in a letter addressed to Brexit Chiefs Negotiators. Services are the basis of both economies, representing 74% of EU GDP and 73% of the EU labour force and 80.4% of UK GDP and 83.5% of the UK labour force. “Services trade related issues are often not seen as decisive in trade negotiations, but in this case and without any doubt, they will be” highlighted Pascal Kerneis, ESF Director. See Press Release & Graphs here. More on EU-Australia on our dedicated page here. ESF supports the view that the Commission’s proposal should address the protection of personal data and privacy. However, ESF considers that some part of the proposal could potentially allow trading partners to misuse a data protection regulation for ultimately protectionist purposes and introduce localisation requirements or bypass any other commitment taken in other part of the trade agreement, and hence suggests amendments. ESF also calls upon the European Institutions to ensure that EU trade agreements include provisions that would enable data transfers both ways and provide legal certainty and predictability. Finally, ESF considers that excluding data flows from regulatory cooperation dialogue is a major missed opportunity for the EU to better explain its privacy regime. See Letter here. The Global Services Coalition sent a letter to EU Member States on 18 April 2018, where it welcomes the long awaited Proposal, which notably states that the EU will ensure that trade agreements include protections against data flow restrictions and against requirements to locate data centres and computing facilities in-country as a condition of doing business. The GSC however raises serious concerns on some aspects of the Proposal, notably a too far-reaching exception for data protection and privacy that can completely undermine the ban of localisation requirements taken in previous commitments”. ESF Chairman Noel Clehane sent a letter to EU Trade Commissioner Malmström and to all Members of the European Commission on 13 April 2018, ahead of the Commission’s College meeting on 17th April in Strasbourg, calling for swift signature and ratification of concluded FTAs, including EU-Japan and EU-Singapore. “In a world that is evolving ever faster with the digitalisation of the economy, ESF members are asking why it is taking so long after the conclusion of the difficult part of the negotiations, to move to the implementation phase” says the letter. ESF urged the Commission to submit the trade parts of these agreements as being full EU competence, to the European Council and the European Parliament, for signature and ratification as soon as possible. On 12 April 2018, ESF has co-signed a letter with other European business associations calling for Quick Progress on the EU-Vietnam FTA that has been concluded for some time, and business is eager to see it ratified and implemented as soon as possible. ESF Managing Director participated to the Gateway of India Geoeconomic Dialogue in Mumbai on 12-13 March 2018, where he talked on Session 3 on « The Future is Trade In Services” – See Video of the session here and Detailed Programme here. “Now more than ever we need to reaffirm the benefits of the multilateral trading system and the open markets for services trade and investment that it supports. That is why the GSC affirms its strong support for the WTO as an institution as well as its rules and enforcement mechanisms” the GSC Statement reads. ESF signed a Joint Statement with 14 other business associations around the globe, representing business from 34 countries and €20 trillion in combined turnover, expressing support for a successful MC11 in Buenos Aires. 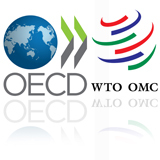 The organisations emphasised the need that the WTO members will rally around the organisation and protect the multilateral trading system for the benefit of all countries and citizens. Today, on 8th December, at the EU-Turkey High Level Economic Dialogue that took place in the Berlaymont Building in Brussels, ESF Chairman Noel Clehane gave the ESF priorities for the hopefully to be-launched-soon Modernisation of the EU-Turkey Customs Union, calling for removing barriers on trade and investment in services sectors and for the opening of the public procurement. The session was cp-chaired by European Commission Vice President Jyrki Katainen and Turkey Deputy Prime Minister Mehmet SimSek. ESF Chairman Noel Clehane wrote letters to EC Vice President Katainen, European Commissioner for Trade, Ms. Cecilia Malmström and European Commissioner for Agriculture, Mr. Phil Hogan to express the support of the European services sectors to conclude an ambitious EU-Mercosur trade agreement, with significant commitments in services. We called upon the EU negotiators to ensure that a deal will seriously improve Mercosur’s’ commitments in services, as well as improve market access and conditions in public procurement. Emphasis was notably made on the need for provisions guaranteeing flows of data are crucial for service providers across sectors to take full advantage of the business opportunities in the Mercosur countries. A similar letter has been sent to the four foreign affairs ministers of the Mercosur countries. ESF and three other European business associations, adopted a joint statement expressing their support for the positive evolution of the EU’s free trade agreements and their trade and sustainable development chapters. “We stress that the intention of the Trade and Sustainable Development (TSD) chapter in trade agreements is to promote long-term cooperation to foster sustainability and promote international standards. It is not envisaged to provide instant solutions to complex issues that are not related to trade, and hence the emphasis must remain on engaging with partner countries in a continuous manner to help them develop and implement international standards and regulations” says the statement, which was sent to the European Council, Commission and Parliament. At the occasion of the Global Services Summit that took place on 17th October 2017 in Washington DC, the Global Services Coalition adopted a joint statement on trade and investment, calling for broad range of services trade and investment questions that need to be addressed. They include “new market-opening, fairness in national treatment of trade and investment, fair and transparent domestic practices, facilitation of cross border data flows and a prohibition on forced data localization for all services sectors, avoidance of forms of cyber-regulation that restrict trade unnecessarily and disproportionately, disciplines on state-owned enterprises, and fresh initiatives towards regulatory cooperation”. The European Services Forum announced the appointment of its new Chairman, Mr. Noel Clehane, Global Head of Regulatory & Public Policy Affairs at BDO, the global auditing and professional services network. The announcement coincides with the ESF’s major conference in Brussels on “Trade in Services: Unlocking a multi-trillion-euro economy for all and across sectors”, which attracted more than 250 participants and high-level speakers, including EU Trade Commissioner Cecilia Malmström. Mr. Donald Tusk, President of the European Council, Mr. Jean-Claude Juncker, President of the European Commission, and Mr. Shinzo Abe, Prime Minister of Japan, met in Brussels today for the 24th Summit between the European Union (EU) and Japan and have reached an “agreement in principle of the Economic Partnership Agreement and the Strategic Partnership Agreement at political level”.This agreement in principle on the main elements of an “EU-Japan Economic Partnership Agreement” will be the most important bilateral trade agreement ever concluded by the EU .ESF issued a short press release today to welcome the political agreement and encourage a swift conclusion. The EU-Australia Leadership Forum (EUALF) is a unique project in the EU’s suite of public diplomacy actions and demonstrates a shared commitment to the already strong bilateral relationship. The Forum’s overall objective is to broaden and deepen the existing ties and in so doing, help shape the vision for the partnership, based on the future EU-Australia Framework Agreement and forthcoming EU-Australia Free Trade Agreement. ESF Director is member of the Multi-Stakeholders Steering Committee of the Forum. Joint Business call to a successful and inclusive conclusion of the EU/Japan negotiations. ESF, along with other European and business organisations sent a joint statement to the Commission outlining how we want to foster a strong trade partnership Agreement/Free Trade Agreement between Japan and the EU. The statement reiterates the value of the EU-Japan trade relationship to our jobs in our respective sectors and also how it will improve regulatory coherence, and thereby expand trade and investment in both economies leading to more economic growth and employment in both Europe and Japan. This statement was co-signed by eleven interested parties representing business across the EU. On 15 May 2017, ESF signed a joint letter with 53 other trade associations covering 11 countries calling on the Chinese government to delay implementation of the country’s cybersecurity law. There are wide-spread concerns about the implementation of China’s Cybersecurity Law. In the letter, the groups signal their belief that the rules will weaken security and fracture markets by effectively erecting trade barriers along national boundaries and across industry sectors that rely on information technology goods and services to conduct business. The European Services Forum (ESF) welcomed the historic vote on 15 February 2017 by the European Parliament to provide its consent to implementation of the EU-Canada Comprehensive Economic and Trade Agreement (CETA). The strong majority shows that the EU can lead future world trade policy with transparent process and democratic support. See Press-Release here and Joint-Statement with Canadian Services Coalition sent to all MEPs before the vote here. Confident that the EU-Japan FTA talks are now reaching an end-game phase, ESF sent a letter on Monday, 12 December to Trade Commissioner Malmström urging the negotiators to move forward the negotiations in a constructive manner and make all efforts necessary to successfully conclude as soon as possible an ambitious and balanced EU Japan FTA (see Letter here). ESF also co-signed a joint European industry letter on the same issue. And finally, ESF and the Japanese Services Network (JSN) brought a united voice of the services industry from both parties in a joint statement calling for the conclusion of an ambitious EU-Japan agreement. The Global Services Coalition is disappointed that it proved necessary to cancel the Ministerial Meeting that was scheduled for the 5th and 6th of December 2016 with the aim of bringing the TiSA negotiations to a timely close. It addressed a message to the Ambassadors and Chief Negotiators of the TiSA Countries to call for swift resumption of negotiations: “It is essential that you find a way to ensure that the progress made in the core text of the agreement, the impressive work that has been done by the negotiators to come close to finalizing texts of annexes on horizontal and sector specific disciplines, and the efforts made by most of the participating countries to improve their market access offers be retained, so that none of the progress to date is lost when formal negotiations resume in earnest”, the letter reads. This entry was posted in ESF on 24/06/2017 by admin.